In the previous post I briefly introduced the PowerShell Configuration keyword which is used to describe desired states for your nodes. Let’s have today a deeper look at its basic logic and see how Microsoft offered us a way to improve its usability in real-word environments. To ease our learning process, we can take advantage of a great PowerShell ISE functionality which is called Snippets. These are reusable sections of code that you can insert into your scripts, just like templates. WARNING: The configuration 'DisableUacIEEsc' is loading one or more built-in resources without explicitly importing associated modules. 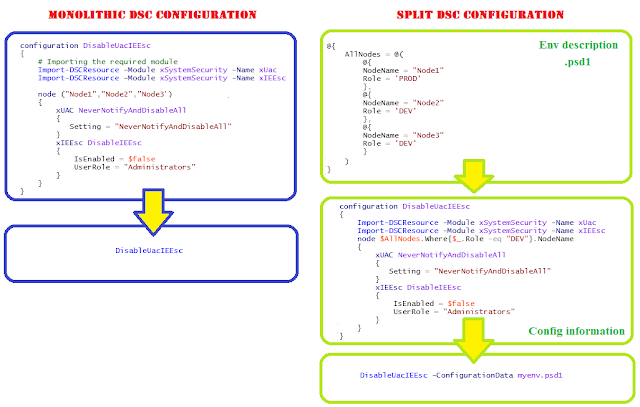 Add Import-DscResource –ModuleName 'PSDesiredStateConfiguration' to your configuration to avoid this message. the –Wait parameter is particularly useful here to follow the configuration application in real-time. In this case the appropriate registry keys are added to the target server. 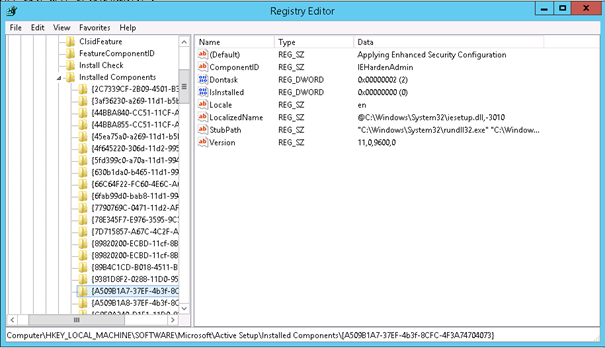 In the example below here’s how the registry keys for IEEsc appear after running Start-DscConfiguration. Now that was the simplest case, which is perfect for the novice to understand how the Configuration keyword works. I want to show you now how you can adopt a less monolithic approach and separate the configurations that you want to apply from the group of target computers you want to apply them to. There are a few major evident reasons for doing so, starting from the fact that we don’t want to hardcode the name of the servers in the same file used for keeping the desired configurations. Let’s exercise a bit and convert the previous example to something more modular and agile. $PSCulture, $PSUICulture, $true, $false, and  $null. In my case I want to disable Uac and IEEsc only on DEV servers, so I replaced the hardcoded node names with the $AllNodes automatic variable and its Where() method. In a next posts we will move the automation slider a bit further. Stay tuned.